Science Fiction has four or five broad themes – sociology of an intergalactic human society many eons into the future, technological advancement and its impact few years into the future, time travel and encounter with alien species. The encounter will alien species was probably the earliest attempted science fiction and it soon became very cliched. Bug eyed monsters, skeletal or reptilian beings – human like when shown at close quarters or not shown in close quarters at all but as a distant force of nature who relentless pursues enslavement or destruction of the human race. Given that authors who can write interesting alien encounter stories are such a rare species, C J Cherry is one to be highly cherished belonging to this rare breed. She manages to build interesting worlds populated with really interesting alien species. Not just one or two but she has created numerous ones in her Alliance- Union cannon consisting of numerous series of which Faded Sun Trilogy is one of the earliest. Mri and Regul are two of the species we meet here. The Mri are a warlike race who are experts in individual combat and hire themselves out as mercenaries. The race is built somewhat like the Samurai except the mercenary part. They have a code of honor and fight individually and have unique traditions and cultures. The Regul on the other hand are a business race who manipulate other species and indulge in complex intrigue within their own species as part of the internal power struggle. Physically Regul have this odd characteristic that they go through larval, pupal and chrysalis phases like some of the insects and frogs. During the larval phase they are sexless and occupy junior ranks. Then they undergo metamorphosis and emerge in the chrysalis phase – the leaders belong in this phase. They gain gender when they emerge in this phase. They have the ability to manipulate their gender according to the political need which throws up interesting possibilities as against the regular human court intrigue. Another fascinating aspect of this species is that they can’t lie. The Regul race communicates telepathically and the thoughts of one is open to all the rest. So they can’t think one thing and say another. So we have a highly manipulative race that indulges in intrigue without being able to lie. The story has a back story wherein the Regul has been fighting a battle of attrition using the Mri mercenaries against the humans. The individually fighting Mri are not able to stand up against the humans who fight in groups and begin to get eradicated. Things reach such a stage that that Mri are going to become extinct. It is at this time that Regul are all set to sign a treaty with humans and destroy the remains of the Mri race themselves. The protagonists are two of the last surviving members of a clan of the Mri species who want to seek out any others who remain. They are befriended by a human. The Regul wants to wipe the Mri out as is customary with most alien species that hire the Mri. Once any species wins the battle using Mri, they want to destroy the Mri so that their enemies don’t hire them and use them against themselves. The three books that constitute the trilogy are rather short and can easily be read as a single book. It introduces the reader to the fascinating world of these two species and their interactions among themselves and with the human race. 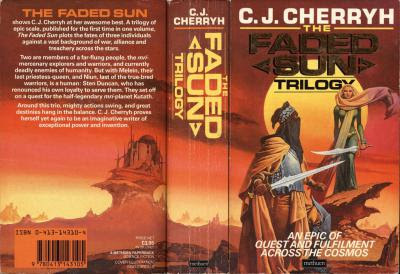 I think Cherryh is one of the most underrated authors who writes fantasy as well as science fiction equally well and has been prolific in her writing. Definitely an author no science fiction buff can afford to miss.